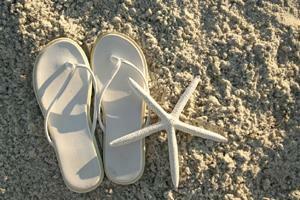 Brides planning a beach wedding may wonder where they can find bridal flip flops to go with their beach wedding dress. There are plenty of great finds for pretty, dressed up bridal flip flops for the big day! Styles vary from platform thongs to embroidered slip-on sandals, with anything from woven grass to metallic soles. Where Can I Find Bridal Flip Flips for My Wedding? Advantage Bridal: A great selection of wedding flip flops are available here, ranging from fabric styles to metallic, crystal studded creations. Price ranges from approximately twenty to over sixty dollars per pair depending on style. Floppy Jo's: Wonderfully designed, delicate wedding flip flops, with embellishment choices of seed pearls, tiny silk florals, sequins, and more. Custom orders are also available, so you can have your flip flops match your dress perfectly. Twenty dollars and up. My Glass Slipper: A good selection here, although mostly white in terms of color choice. Styles range from a short-heeled metallic flip flop to the ultra-comfy wedding wedges. Prices range from approximately twenty to sixty dollars. Tracey Asai Designs: Perfect for the bride who wants beach footwear with elegance, these custom bridal flip flops are made with moiré taffeta for a wonderfully shimmery look and great choices in delicate accents and embellishments. Wedding Tennies sells a variety of flip flops and casual wedding shoes, including custom-painted flip flops that can be designed with your wedding theme. The Knot Wedding Shop: Sells colored, 'just married', 'bride' and other flip flops. Banana Jack: Many colorful choices in Hawaiian flip flops. Havainas, the premier name in flip flops, offers many great styles, from floral to camouflage to their cute kitten heeled flip flops. For those brides who just can't find what they're looking for, adding embellishments to a pair of white or silver flip flops can create an inexpensive and customized look. Browse the craft store for items to embellish your flip flops, such strings of faux pearls or white silk rosebuds, and work a little magic with the hot glue gun. For the modern bride wondering 'Where can I find bridal flip flops?,' there are plenty of options whether in the form of making your own, purchasing a custom pair, or simply purchasing them from a wedding shop or department store so you can step out on the sand with style.